This release marks a second 2-disc compilation of recordings from ‘forgotten’ or neglected musical productions that were performed in London between 1943-1962. Musicals of that era still paid huge debts to music hall, and was often chirpy with a strong Cockney bent. That’s fine, if it’s your cup of tea, but it can be a touch twee otherwise. But assuredly, whatever your genre tastes, lovers of old school musical theatre will find this collection a treasure trove. Jeremy Brett – Wonderful View from the musical Marigold, performing with Sally Smith. Putting his rich, mellifluous baritone to good use, Brett delivers a sentimental love song that’s performed as a duet. An experienced musical theatre performer, he would later appear in the movie version of My Fair Lady (in which he was scandalously dubbed!) Brett topped off a highly distinguished career by becoming the definitive Sherlock Holmes in Granada’s 1980s television series. Spike Milligan – Wish I Knew from Lady at the Wheel. Spike would occasionally make stage appearances, such as often reprising the part of Long John Silver at the Mermaid Theatre in Treasure Island. This performance, from 1958 when he was already a radio star thanks to The Goon Show, demonstrates a surprisingly fine singing voice. Anna Neagle – The Years Together from King’s Rhapsody. The darling of the West End sings a song composed by Ivor Novello, who was also in the cast for this 1949 production. Barbara Windsor – Where do Little Birds Go? from Fings Ain’t Wot they Used T’Be. The cherished national treasure’s unmistakeable squeaky Cockney tones delivers a saccharine song on ornithological observation. Frank Sinatra – If She’d Only Looked My Way from Gay’s the Word. Ol’ Blue Eyes sings an Ivor Novello number from a 1951 Saville Theatre production. As you might expect, his timing and phrasing are immaculate and distinctive. A standout song on this collection. Noel Coward – Uncle Harry from Pacific 1860. Coward performs in his own musical from 1946, which played at the Theatre Royal Drury Lane. The lyrics are witty and delivered at pace – typical Coward! Joan Sims – You Never Know With Men from The Water Gipsies. The much-loved Carry On star sings in a catchy number from a 1955 production of an often-revived musical. Millicent Martin – Our Language of Love from Irma La Douche. Martin would go on to be a television star with the That Was The Week That Was crowd. Here, she’s performing a reflective love song from a successful 1958 production. The show also starred Keith Michell. Ron Grainer – provided the music for 1962’s Cindy Ella/I Gotta Shoe. The following year he supplied the music for the title sequence to Doctor Who (which, regardless of the fate of his musical theatre ventures, remains part of the public consciousness four decades after his death). If you love theatre performers of that era, chances are you’ll find favourite amongst this remarkable collection. The sound quality is very good, and these two CDs pack in a lot of material. 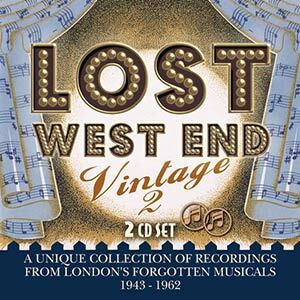 Revisit a golden age of musical theatre with Lost West End Vintage 2.